There are now less than seven weeks until Election Day and all signs point to a contest in which the president-elect will win the White House without a majority of the vote. With the race between Donald Trump and Hillary Clinton tightening over the last month and north of 10 percent of likely voters still stating they will support Libertarian Gary Johnson or Green Party nominee Jill Stein, the prospects of one candidate rallying the support of more than half of those who come out to vote seems dim. To be sure, there are two key variables that enable an electoral result that produces a plurality-winning victor: a close race between two candidates and some support for a third party candidate. In national polling of the four-way race, neither major party nominee has surpassed the 45 percent mark more than a handful of times across dozens of surveys conducted since the beginning of the summer. Current polling averages show Clinton with a shade over 41 percent of the vote, Trump just north of 40 percent, Libertarian nominee Gary Johnson at eight percent, and Green Party nominee Jill Stein at three percent. Of course, it is possible that a surge by Trump or Clinton, depressed support for third party nominees as Election Day approaches, and the additional allocation of undecided voters could put one of the candidates into an outright nationwide majority. But, in this extremely polarized electorate with political parties racking up record partisan winning streaks across three dozen states, one could also envision a scenario in which Trump and Clinton eclipse 50 percent in many heavily Republican and Democratic states respectively, but both are still held below that mark nationally. At the moment, however, most states do not show that either candidate has the backing of a majority of likely voters. Putting aside the fact that tens of millions of eligible U.S. citizens will not participate in the 2016 election, it now seems quite likely that a majority of voters will be left with a president they did not support at the ballot box. So how many states will end up backing a plurality winner in November, and what would be considered an unusually high number? Smart Politics reviewed the nearly 2,000 statewide elections for president conducted since 1828 and found that 332 were won by presidential candidates without a majority of the vote in that state (16.7 percent) with Ohio, California, Wisconsin, and Indiana doing so at the highest rate. While three of these cycles produced Electoral College blowouts (1912, 1992, 1996) strong third party showings by Teddy Roosevelt, George Wallace, and Ross Perot caused historic splits among statewide electorates. 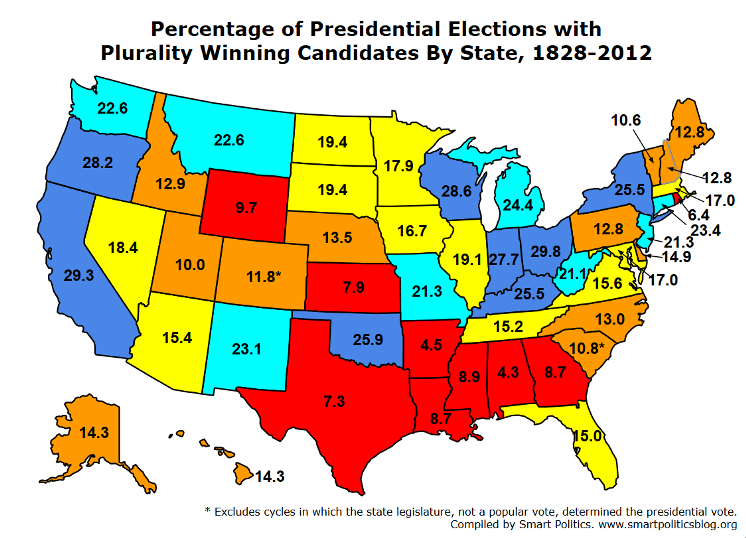 At least a quarter of the states produced a plurality-winning candidate in six other cycles: 1848 (34.5 percent, 10 of 29 states), 1860 (31.1 percent, 10 of 32 states), 1888 (28.9 percent, 11 of 38 states), 1916 (25.0 percent, 12 of 48 states), 1924 (29.2 percent, 14 of 48 states), and 1948 (27.1 percent, 13 of 48 states). There have also been 11 cycles since 1828 in which every state was won with a candidate notching a majority of the vote: 1828, 1836, 1864, 1868, 1872, 1900, 1944, 1956, 1964, 1972, and 1988. And which states have been home to the most plurality winners? It should not be surprising that Ohio leads the way with the highest rate of elections backing a candidate with only a plurality of the vote, doing so in 14 of 47 races since 1828 (29.8 percent): in 1844, 1848, 1852, 1856, 1888, 1892, 1912, 1932, 1948, 1968, 1976, 1992, 1996, and 2000. Smart Politics has previously documented how Ohio has been the most politically divided state in the country in presidential elections for the last 180+ years – boasting the lowest average victory margin and the largest number and percentage of races decided by less than five points. In other words, Ohio produces unusually competitive, close races leaving the winning candidate vulnerable to a plurality showing whenever there is a semi-credible third party option on the ballot. All four regions of the country are represented in the Top 10 with California owning the next highest rate of plurality-winning candidates at 29.3 percent followed by Wisconsin (28.6 percent), Oregon (28.2 percent), Indiana (27.7 percent), and Oklahoma (25.9 percent). Rounding out the Top 10 are Kentucky and New York (25.5 percent), Michigan (24.4 percent), and Connecticut (23.4 percent). 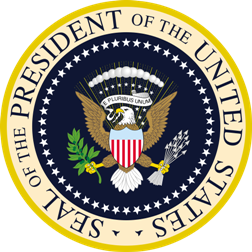 Indiana holds the record for the most consecutive cycles with a plurality winner, doing so five times in a row in 1876 (Samuel Tilden, 48.7 percent), 1880 (James Garfield, 49.3 percent), 1884 (Grover Cleveland, 49.5 percent), 1888 (Benjamin Harrison, 49.1 percent), and 1892 (Cleveland, 47.5 percent). Ohio (1844-1856), New Mexico (1992-2004), and Wisconsin (1992-2004) have done so in four straight cycles. Midwestern states have been most likely to produce plurality-winning candidates in presidential races over the decades, doing so at a 20.9 percent rate across the region’s dozen states (103 of 493 elections). The West is next at 18.7 percent (72 of 386) followed by the Northeast at 15.9 percent (82 of 517) and the South at 12.8 percent (76 of 594). All four regions are also represented in the Bottom 10 of the list for the lowest rate of plurality winners: Alabama (4.3 percent), Arkansas (4.5 percent), Rhode Island (6.4 percent), Texas (7.3 percent), Kansas (7.9 percent), Louisiana and Georgia (8.7 percent), Mississippi (8.9 percent), Wyoming (9.7 percent), and Utah (10.0 percent). Previous: 28 Going On 29? 2 Comments on "Plurality Bites: Majorities in Many States Won’t Vote for Their Electoral College Winner"
And, of course, DC has NEVER awarded its electoral votes (ALL three of them !) to a “Plurality” Winner, since being first allowed to cast them, starting back in 1964! You should be a part of a contest for one of the finest blogs on the net. I am going to highly recommend this blog!